Whether or not you have e-books you bought with an e-reader, you can read anything on a Windows 10 PC. Sometimes, though, you have to get a little creative and bring in apps that can do the heavy lifting. Windows EPUB readers are a dime a dozen. Actually, they’re free. Before you try to download and install one on the desktop, run through the Windows Store (just tap or click the Store tile in the taskbar) and see whether any highly rated EPUB readers are available. Just use the search box to look for the text EPUB. If you can’t find a tiled Universal Windows EPUB reader that you like, you have several choices for desktop apps that can read EPUB files. Arguably the best of the bunch is Adobe Digital Editions (ADE), which is free. ADE does yeoman’s work of rendering EPUB and PDF/A files accurately, and it includes note-taking features. ADE also allows you to read files that have been copy-protected with the ADEPT (Adobe Digital Experience Protection Technology) technique. Barnes & Noble uses a form of ADEPT copy-protection on its books. ADEPT was reverse-engineered years ago, and several programs (including programs called inept and ignoble) can crack the encryption. PDF viewers are also a dime a dozen. The viewer that Microsoft built into Microsoft Edge, shown here, works reasonably well, although it doesn’t have any bookmarking or note-taking capability. 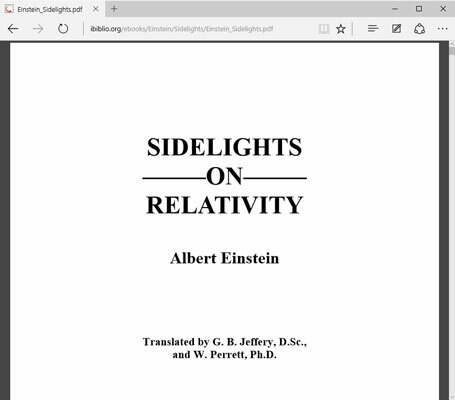 Microsoft Edge has a built-in PDF viewer.